The basic idea here is not new. Sports teams try to use any information they can in predicting future success. In football all draft prospects go through a ridiculous battery of physical and mental tasks. From the 40yd dash, to the pseudo-IQ test (The Wonderlic). Watch a draft analysis in any sport and you’ll hear a lot of jargon regarding the variables used. Most of it is about physical performance or the occasional ill-defined variable (leadership, sticktoitiveness). The intresting thing here, is using text from athletes’ prior conversations improve predictions of future success. Does the way he speaks in press conferences have anything to do with his future success (or lack thereof)? Can anything psychological, or just non-physical, add predictive power for sporting success? If yes, then how these “psychological factors” be reliably measured? Enter textual analysis and the company Achievement Metrics. [the company] analyzes the speech of star college players, looking for traits such as “conceptual complexity,” “need for power,” and “deliberativeness.” It compares similar players and correlates these traits with future performance. When I think sports quoutes, I think of borning semi-scripted question and answer sessions. When players do deviate from the script it may occasionally produce unintentional comedy, as seen here, here and here, but nothing of value comes from it. Right? Allow me to translate: the players in the top right quadrant rated high on both of the company’s measures, players in the bottom rated low on both. In this case the measures are “in group affiliation”, feeling like you’re part of the group and “positive power”, feeling of control over outcomes. Who is in each quadrant? I’m not sure how much this proves. 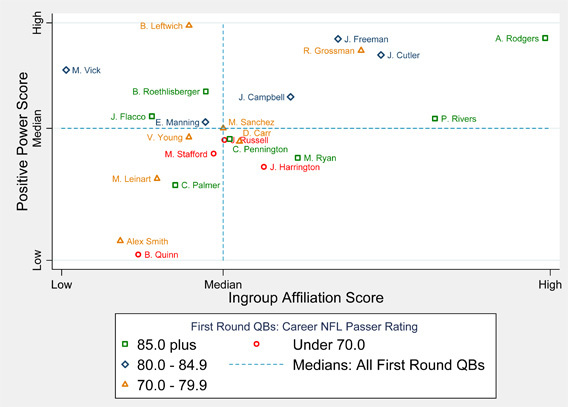 There are a million questions regarding the methodology that I am not qualified to address, but it is interesting how the busts seem a bit clustered together, and the best player on the graph rated very high on both measures. [the company] is attempting to bring text analysis to nontraditional areas, like the CEO’s corner office and, yes, the scouting of pro athletes. I feel a fun side experiment coming on. Perhaps at the next big science conference I’ll tape the chatter at poster sessions, or maybe a few talks. See if I can’t correlate something. My alma matter video taped most talks, including job talks. I can tell you there are some question and answer sessions just begging to be analyzed. Perhaps some department will catch on to this and hire this company to take a look at job interview tapes. I don’t know if I would put much stock in this. The definition of the variables strikes me as a bit arbitrary. You have to wonder whether or not they picked the variables they would use to make the data cluster in a particular way and omitted data points that went against what they expected. There are some notable omissions from the data, like the other Manning brother that isn’t a total douche, and what about QBs from that supposed great class of 1999 (Couch, Akili Smith, McNabb…). The other part of this that doesn’t quite add up to me is that the supposed top QBs that get taken low in the first round of the draft inevitably get taken by poor teams with sieve like offensive lines and get thrown into the fire before they may be ready (e.g, Alex Smith 1st, Stafford 1st, Matt Leinart 10th and on the other end Rodgers was taken 24th, Freeman 17th although Rivers would certainly be the exception but you gotta figure one of those number 1 picks is gonna work out eventually! ).